On January 23rd, a new and spectacular exhibit opened at The State Museum of Pennsylvania. The star attraction is a completely articulated skeleton of an adult mastodon. A mastodon is one of two types of elephants species that roamed Pennsylvania during the Ice Age over 12,000 years ago. This individual stood nine feet tall and would have weighed 8000 to 10,000 pounds in the flesh. They inhabited an open woodland environment and browsed on twigs and leaves. The specimen was discovered in 1968 near Marshalls Creek in the Pocono’s. The other type of woolly elephant that lived in Pennsylvania was the mammoth. These were larger than mastodons with high foreheads and longer tusks. Mammoths grazed on grass and lived in an open environment with bison and horses. That both elephant types were contemporaneous, demonstrates the diverse nature of the forests and grasslands that covered Pennsylvania during the Ice Age. The mastodon skeleton is part of a larger exhibit called Tusks! Ice Age Mammoths and Mastodons. Created by the Florida Museum of Natural History, this exhibit features more than 80 specimens that include rare Ice Age animals such as saber toothed cats, horses, bison, short faced bears, giant ground sloths and giant armadillos. These were all recovered from rivers in Florida and are very well preserved. Due to their large size, these animals are called megafauna. They were the most common type of animal all over the world during this time and their large size was an evolutionary response to the cooler temperatures of the Ice Age. Megafauna were the dominate animals for about two million years when, for reasons not totally understood, they became extinct about 11,000 years ago. The Marshalls Creek mastodon was excavated by paleontologists who study life in the past based on fossils. Many of the remains in the Tusks! exhibit were excavated by archaeologists who study past human behavior based on artifacts. Archaeologists are very interested in these animals because they tell us about the environment of the past and, in fact, some of these animals were hunted by the first humans in the New World. The Tusks! exhibit includes stone tools that may have been used to kill or butcher these animals. Archaeologists are interested in understanding the relationship between extinct Ice Age animals, especially mammoths and mastodons and the earliest humans in the New World. Of special interest to archaeologists is the question - Why did the Ice Age megafauna become extinct between 11,000 and 15,000 years ago and did humans have a role in their extinction? Since the 1970s, the so called “Clovis First” theory has proposed that humans migrated into North America about 12,000 years ago via the Bering Strait Land Bridge. They entered a land where the animals had no experience with the killing power of spear throwing Paleolithic humans. These early migrants to the New World focused on big game hunting and as they moved south, they exterminated the animals in one region and moved onto the next. There are approximately sixteen sites west of the Mississippi River that contain the remains of mammoths (n=62) and mastodons (n=2) killed by these early hunters. East of the Mississippi there are five sites containing five mastodons possibly killed by humans. All of this is known as the “over-kill hypothesis” and blames human hunting for the mass extinction of these animals at the end of the last Ice Age. Challenging the “Clovis First theory”, is the “Pre-Clovis or early entry theory” that proposes that humans migrated into the New World between 18,000 and 20,000 years ago and slowly spread throughout North and South America. They were opportunistic foragers who hunted animals, fished and gathered plant foods. There were so few of these people that they are practically invisible in the archaeological record and very few sites have been found from this time period (prior to 12,000 years ago). Gradually, these Pre-Clovis populations increased and by 11,100 years ago, they invented a very distinctive spear point style called a fluted point and their artifacts became more common at archaeological sites. Pre-Clovis people probably also hunted elephants, there are a few examples in South America but they did not cause their extinction. In response to the “overkill hypothesis” the proponents of the Pre-Clovis theory remind us that humans had been hunting megafauna in the Old World for tens of thousands of years and they did not cause their extinction in those regions. They argue that environmental change was the reason for their demise. There have been numerous discoveries of mammoth and mastodon in Pennsylvania but so far, none show butchering marks by humans and none have been found with stone tools. However, the Marshalls Creek specimen is very interesting. While over 90% of the skeleton was recovered, the tusks are mysteriously missing. The carbon 14 dates for this specimen are 12,000 years old and Pre-Clovis in age. Ivory was a extremely valuable resource. Could the tusks have been removed by early hunters? Or were they instead scavenged by Clovis peoples sometime after the mastodon’s natural death? Archaeologists continue to research these questions and others in attempts to better understand early human cultures. Please come view the exhibit yourself and read about these fascinating finds. There is much more to learn about our past and the newly restored Marshalls Creek mastodon is now preserved for all to appreciate. The Tusks! exhibit will be on display until May and at that time the Marshalls Creek Mastodon will be moved to the State Museum’s Hall of Geology on the third floor for permanent display sometime in the fall. A remarkable cache of stone tools was discovered when Chuck Forsyth was digging a foundation on his property in 1984. They were found in a rectangular cluster approximately 15 by 12 inches in size. The site is situated on a slope of land overlooking the Schuylkill River at Douglassville, Pennsylvania. It has been recorded in the Pennsylvania Archaeological Site Survey (P.A.S.S.) as 36BK572. The cache includes 40 stone objects grouped into two categories – notched implements (n=35) and cobblestones (n=5). Dr. Robert C. Smith, Pennsylvania Geological Survey, (Retired) kindly identified the lithic materials used in their manufacture. The lithic materials include sandstone, quartzite and crystalline limestone. These are all locally available in the nearby Schuylkill River gravels. Although made from different lithic materials, the shapes and sizes were remarkably similar. They were all shaped using a stone hammer. The quartzite specimens were made on large flakes whereas the sandstone and limestone pieces were generally bifacially flaked (i.e. flaked on both faces) from large angular blocks. The cross-sections were evenly divided between bi-convex and plano-convex. There is a tendency for the blade element to be slightly wider than the rest of the tool. Most of the poll elements show slight to no modification with a few maintaining the smooth cortical surface of the original stone. All of the specimens are uniformly bi-notched on their lateral faces. Notching was completed by making two well pronounced u-shaped indentations that, in turn, were rounded to remove most of the ridge scars which we attribute to the manufacturing process of percussion. It is assumed that the notches were part of the hafting mechanism that is attaching the implement to a wooden handle. The function of these implements is problematic. They could have been used as axes but the sandstone and limestone are soft and would not have worked well. The quartzite is harder but the bits on this material are relatively thin. Our working hypothesis is that they were used as hoes for digging and weeding. This is not the first time this shape has been found but this is the largest collection from a single site. Why were so many left in one spot? If they were hoes used in farming, why don't we see more at other Native American farming villages? It has long been recognized that stone hoes are not common on farming sites. It is felt that perishable digging sticks or elk scapula were used for this purpose and because they are made from organic materials, they are very rarely recovered in archaeological excavations. We would like to a conduct microscopic examination of their working edges to solve this mystery but budget cuts have delayed this type of analysis. Unfortunately there is little information that can lead us in the direction as to the age of the cache. We know for example, that plant cultivation began somewhere in the Late Archaic Period when gourds, seeds and tubers were among the incipient elements of plant husbandry. This would date the cache to around 5,000 years ago. It is highly unlikely, however, that the cache dates to that early period, because stone hoes are not usually associated with Archaic period artifacts. On the other hand, crop cultivation is usually associated with the Late Woodland Period of 1000 to 500 years ago in the Piedmont region of Pennsylvania. It was at that time when corn, beans and cucurbits such as pumpkin squash and a few other crops became mainstays for humans then living along the Schuylkill and other drainages of Pennsylvania. By all measures, the archaeology exhibit at the 94th annual Pennsylvania Farm Show was a resounding success. 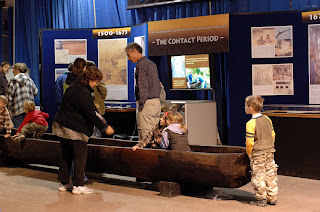 Throughout the course of the week, tens of thousands of visitors to the show enjoyed the ever popular replica dugout canoe, select artifacts on display excavated from historic sites across Pennsylvania, complimentary posters and brochures, and flint knapping demonstrations. It is clear by the volume and enthusiasm of the crowd, the public is very much interested in and values its rich cultural heritage. Children, adults, and even a canine critter named Bandit the biker dog experienced a “ride” in the dugout canoe. Constructed solely with stone tools, popular questions about the canoe included length (20ft. ), weight (approx. 600 lbs.) and type of wood (pine). And yes, it does float. Visitors also inquired about many of the objects on display such as the lead pencil and clay marbles from Eckley Miners village, the late 19th century glass bottles from the oil boom town Pit Hole City, and the glass trumpet found at Ephrata Cloister. The “eagle eyes” award goes to the gentleman who spotted an error on our Trails of History banner. He is quite right, the road labeled 76 between Harrisburg and Allentown is in fact 78. Fortunately, that minor flaw didn’t stop folks from learning about how archaeology contributes to our understanding of the past, and ultimately, how it can help us in the future. A singularly unique aspect at the Farm Show, special thanks goes to Bob Winters for his flint knapping demonstrations. All week long, the young, old, and everyone in between were fascinated by the all but lost craft of chipped stone tool production. Thanks must also go to all the volunteers who dedicated their time to staffing the exhibit throughout the week. Your help is much appreciated; we couldn’t do it without you. Hope to see you next year! For most years since 1980, there has been an archaeology exhibit at the Pennsylvania State Farm Show. This year is no exception. It is a great opportunity to show off recent research such as our work on prehistoric archaeological sites or our experimental archaeology or special topics such as Native American farming. The theme of this year’s Farm Show exhibit is “Archaeology through the Pennsylvania Trails of History”. The exhibit will feature the results of significant archaeological investigations at sites maintained by the Pennsylvania Historical and Museum Commission (PHMC), and it will use these sites to illustrate the value of archaeology to our own society. At a time when some in the public are questioning the benefits of archaeology and the value of our historic sites, we think this exhibit will provide some answers. The Pennsylvania Trails of History is a visitor’s guide to the historic sites operated by the PHMC. The exhibit will consist of a large map depicting the Trails of History and featuring significant PHMC sites where archaeology has been conducted. Artifacts from these sites will be displayed in two exhibit cases. The featured sites are Graeme Park, Drake Well, Eckley Miner’s Village, Old Economy and Ephrata Cloister. Each will be used to demonstrate how archaeology benefits our society. The accompanying brochure details the significant findings at these sites and the value of archaeology. This brochure should be a great addition to the PHMC series. 1) Archaeology provides a heritage for those who do not have a written language. It is our only record of the past prior to writing. 2) Archaeology, along with the written record, provides a more balanced description of the past compared to the biased written record alone. 3) Archaeology descriptively paints a picture of how people once lived and provides a tangible connection to our past. 4) Archaeology identifies long term patterns on how and why cultures change so that we can better plan for our own future. The exhibit cases will contain artifacts from each of the five properties featured on the banner. Of special note is the glass trumpet, excavated at Ephrata Cloister. The actual artifact is very fragile and we only have a life size picture as a proxy exhibit. As in years past, the dugout canoe will be at the Farm Show for the children to sit in and imagine paddling down the rivers of Pennsylvania during prehistoric times. While the children are enjoying themselves, staff will engage the adults in a discussion of the value of archaeology and the need for the protection and enhancement of archaeological resources. Our mission is to make the public more aware of the rich archaeological heritage preserved in Pennsylvania and that this heritage is threatened by modern development, urban sprawl and governmental indifference. 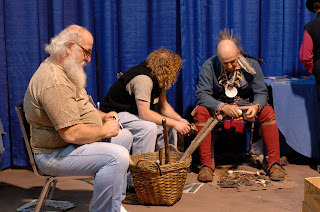 Robert Winters, a Native American re-enactor and lithic technologist will provide demonstrations on stone tool manufacture and display skillfully replicated Native American ornaments and tools. It is a wonderful opportunity to get up close and personal with Native American technology. Bob has been a favorite at the Farm Show for many years. The exhibit is a cooperative endeavor by the Society for Pennsylvania Archaeology, Inc. (SPA), the Pennsylvania Archaeological Council (PAC), the Pennsylvania Department of Transportation (PennDOT), and the Pennsylvania Historical and Museum Commission (PHMC). Considering the devastating budget cuts to the PHMC and the elimination of grants to non-profit organizations such as PAC and the SPA, public outreach is particularly important this year. Every effort will be made to make the public aware of these cuts and what they mean to Pennsylvania’s archaeological and historical heritage. For example, public education is going to be increasingly difficult without grant programs for the non-profit organizations. Travel for school programs or field research has been reduced and in some cases eliminated. Plans for new exhibits have been cancelled and the maintenance of existing exhibits has been reduced. Many historic properties have been closed and these are the tangible remains of Pennsylvania’s heritage. The Farm Show runs from 9:00 am on January 9th to 5:00 pm on January 16th. The exhibit will be located in the northeast corner of the main exhibit hall, the same location as in previous years. It is a spectacular cultural event, so please come, participate and enjoy the great food. It’s a fun experience for the entire family!